COME SOAR WITH ME TO DIVINE DESTINY! What is my divine destiny? Yes, we should ask and we should know. The most important mission, goal, or appointment in the world is: divine destiny - the one God chose for us. How many people have died and never found their true paths? their divine assignments? Millions affect ONE. One affects millions. May God help us now. These books, Detours to Destiny, were written by the pen of a ready writer to us all, for us all - at least all who'd care to know and who'd dare to grow! Are you living in error? Practicing dead traditions? A victim of deadly soul ties? Are you misguided? Is your zeal for the unreal? What road are you on? What pit are you in? Caved in carnality or in the Den of despair and defeat? Is this just a test? Find your way - This is the time and the day! CLICK ON BOOKS FOR FURTHER INFORMATION. Experience the powerful examples of called men of God; Travel down the roads of Moses, Jacob, David, Joseph, Paul, Peter, Daniel, Shadrach, Meshech, Abendigo, Job and Jesus and be inspired by how they conquered their call by shaking up towns and nations. We are told to do the same. You are sure to find your pathway to Divine Destiny... Don't you want to get to the Palace out of the Pits, Pens, Caves & Dens of life... Take the Humility Evaluation and see how you rate... Know the Greatest Lessons Ever Learned... Meditate on Famous Destiny quotes and famous Wilderness Quotes...Use the free Destiny Workbook spiritually designed to guide you thru in 40 days: "40 Days to Destiny"; Hear the Prophetic Words from today's prophets... Enjoy the power of PROPHETIC Poetry... Hear Twelve Prophets of Today Speak and ...Find out where you stand? In addition, we are all familiar with the Old and the New Testament, the Lost Books of the Bible, and the Apocrypha, but have you heard of The Third Testament? Have you read the Testament of Love... and many other significations and revelations ordained and contained by God, the Father written, but hidden from His children in this last day and time? 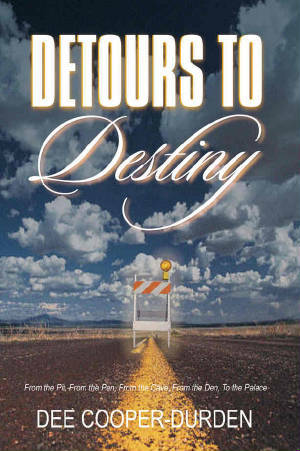 Enjoy the anointed writings of several great authors of yesterday and today who were humble enough to contribute authentic articles full of insight and wisdom related to the subject and summation of "Detours to Destiny"; Hear the Prophets..Hear the Father...and much, much more as the Holy Spirit guided for a people in a nation in trouble. So the shaking has began. Are you ready for this? It's here, whether you're ready or not. Get ready. Your destiny, your choice. Investigate the choices just as I have and now present them to you as the Holy Spirit guided. I have so much that The Most High God YAH has given for me to share with everyone and the time is far spent. There is war in the heavenlies and Humanity must be prepared. We must know who we are in order to be present at our assigned posts standing ready at attention. God wants us to be powerful, vigilant, knowledgeable - yet calm and confident during the storms of life. We're headed for something great, mighty, strong and different. E-books are available here and are downloaded as soon as you order (free of charge) because the hour is so late. If there are any questions, please email me at dcdurden@gmail.com or text 713-249-1076. Love You. Thank you for visiting. From the Pits, Pens, Caves & Dens..... to the King's Palace! Click on bible to read the King James Version. Thank you for visiting this website. I will share some of my special projects that I am working on; personal and family information; and some of my prophetic poetry. May God Bless You. May God bless each person who visits this site. Please don't fail to tell us about it.